See this thread - http://antiqueradios.com/forums/viewtopic.php?f=3&t=269342 - for my 1.5 year project (so far) to restore my grandfather's 1948 Philco 48-1000 TV, which was stored in a puddle in a garage for 50 years. It is electronically working now, more or less, and I'm moving on to the cabinet, hence a new thread here in the Cabinet Restoration forum. Below are some pictures of the cabinet, when I got it and in its current, less-assembled state. File comment: Insides were a mess. File comment: Cabinet as it is today. I want to keep as many original pieces as possible, so I'm trying to avoid replacing all the bad wood. Any thoughts, opinions, insights, advice - all would be appreciated! Wow Steve, that's quite a project you're taking on, but I'm impressed that you are going for it. I have seen basket cases restored in the past and it's surprising what can be done. A google search may lead you to similar projects and good tips. When you get all the delamination re-glued it returns the rigidness to the cabinet and things don't look quite as bad. Good luck with it. I'm looking forward to seeing the set finished one day! For the speaker grill, it seems it was painted gold? but not solid gold? The pictures I can find of a 48-1000 show a gold-coated speaker grill, but with much dark between the openings. --> Does anyone know how the grill *should* be painted? I'd paint the trim line around the screen in the same gold - it was gold originally too. And the centers of the knobs too, which were gold. I have one at home but that's not much help so here's a picture from Radiolaguy. It appears the surface area is gold but the holes and crosshatches are not, also it's hard to find gold that matches the vintage stuff very well. The knobs should have Brass inserts and will polish out nicely (unless they are missing). Philco knobs should be fairly easy to locate if it comes to that. Thanks Eric. I've seen pictures like that of the original sets. I could not figure out how they painted it such that only the tops of the "pillows" on the speaker grill got paint, but not the inside of the holes or the crosshatches between them. In the end I just sprayed it gold. I may try some acrylic dark wash that I have in the crosshatches to see if it looks any more like the original. Note: the gold is not so bright and washed out as in the photo. It is a deeper richer gold, closer to, though not the same as, the original. Last edited by sdyer on Oct Sun 23, 2016 2:02 am, edited 2 times in total. For the final lacquer on the whole cabinet - satin or gloss finish? I would go with semi gloss lacquer , 60-70 % shine. I'm thinking of Mohawk brown mahogany (the middle color on my test board), perhaps with some clear/amber lacquer over that. The pictures I have of it, like the first pic below that I got off the internet, show a redish/orangish finish. I think the brown mahogany/amber combo would get close. Do you think that would replicate the original finish color? it may not be origional but it looks so much better with the whole speaker grill painted gold i would leave it that way for sure. also i would probably paint the inside of the holes gold. yes i usually like everything original but in this case all gold looks much better. QUESTION: for polishing and such, I've heard that a gloss lacquer finish can be "rubbed out" so that it is nice and deep and original looking, not highly glossy. Is that what "Deluxing Compund", like from Behlen is for? How do you rub out the finish so that it is rich and warm and doesn't scream "i've just been refinished", and isn't full on mirror glossy? Another question - after I strip off the old finish, should I oil the old, probably dry wood? If so, with what? Third question - is minwax spray gloss lacquer good for the gloss coats (to seal before toned lacquer, then after the toned and amber lacquer to seal the whole thing up)? Or should I use Deft or a different brand? Which lacquer to you prefer? Here is a good view of the wood grain and finish (what's left of it) on the one good side of the cabinet. Does it look like Mahogany? I my brown mahogany toned lacquer + amber lacquer plan a likely match? No, do not oil the wood. Yes, it appears to be mahogany. Stick with just the Brown Mahogany toner, no need to use amber over it. The amber color you're seeing is the old clear lacquer that has discolored with age. I prefer to use Mohawk clear and toner lacquers. Here are the basic steps to recreating a classic lacquer finish. Behold, the power of Brasso. Impressive! Nice work on those knobs. HELP - I can find no *defninitive* information on whether the veneer is walnut or mahogany. I have very firm answers from various sources on both. Does anyone know how I can tell for sure? Do you know anyone who would know for sure? Wood type: That is hard to tell from those photos. It does not look like mahogany, but it does not look like walnut either. The grain resembles birch, but the color is not right for birch, so it could be yet another type of wood. To get a better idea, do this. Strip and sand a large section with fine sandpaper. Wet it with a damp sponge and immediately take pictures before it dries. Get close-ups and overall views of that area and post them here. You will get several opinions. Could it be rosewood? A friend of mine suggested that. 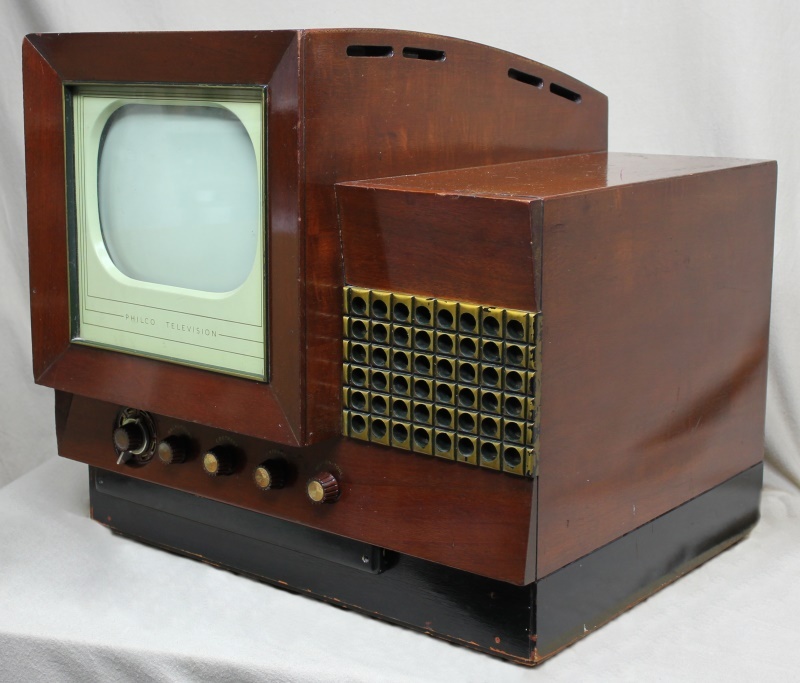 Did Philco or other TV manufacturers use that type of wood? Can not wait to see the finished project!